Love, Bettina. 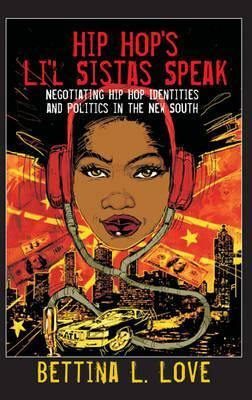 Hip Hop’s Li’l Sistas Speak: Negotiating Hip Hop Identities and Politics in the New South. Ed. Shirley R. Steinberg. 399 Vol. New York: Peter Lang, 2012. Print. Studies in the Postmodern Theory of Education. Bettina Love’s Hip Hop Li’l Sistas Speak shows that Black girls’ bodies are a major landscape of Southern Hip-hop music. In this ethnographic project born out of Love’s dissertation, she explores the lives of six teen-aged Black girls in Atlanta, Georgia (ATL), also known as the Motown of the South, and their relationship to Hip-hop music and culture. One of the most intriguing aspects of Love’s project is her focus on methodology and her positionality as a Black girl researcher from the North, from an earlier Hip-hop generation, who is also lesbian. Lanehart, Sonja L. “The Language of Identity.” Journal of English Linguistics (1996): 322-31. Print. Morgan, Marcyliena. “No Woman No Cry: Claiming African American Women’s Place.” Reinventing Identities: The Gendered Self in Discourse. Eds. Mary Bucholtz, A. C. Lang, and Laurel A. Sutton. New York: Oxford University Press, 1999. 27-45. Print. In this chapter Marcyliena Morgan analyzes thress different cites of African American female discourse use: 1) children’s play, 2) adolescent girls’ verbal activities, and 3) adult interaction. She contests the notion that Black vernacular is male constructed and dominated, and that is only in reaction to racial oppression. Through a cross-generational analysis of Black female discourse practices Morgan concludes that her illustrations of how African American girls, young women, and women grow and function as core social actors shows that they are a part of the vernacular culture, not at the periphery. She also theorizes that their identity is tied to the construction of what she calls a cool social face (41). Social face is an impression formed of a person based on her or his self-presentation (Goffman 1967). The African American cultural concept that both critiques and symbolizes social face is the notion of being cool – “current and trendsetting, calm, detached, yet in control (cf. Major 1994; Smitherman 1994) (31). Morgan defines a “cool face” as “the ability to enact subtle symbolic cultural practices with eloquence, skill, wit, patience, and precise timing” (31). Morgan asserts that Black women and girls protect and maintain this face though language games such as he-said-she-said games, instigating, and conversational signifying (41). Morgan urges scholars and analysts to reanalyze the research that has defined sociolinguistics and conduct new research that includes women as social actors.